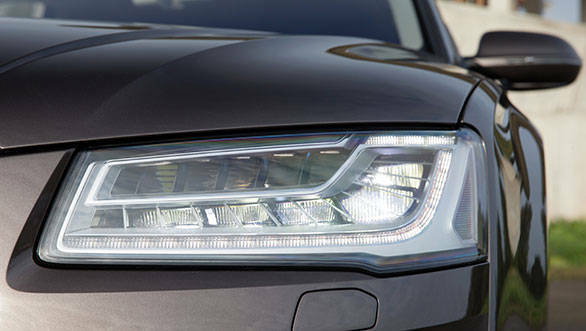 Audi has been the master of automotive lighting for quite a while, particularly with the usage of LEDs. They were the pioneers of LED day time running lamps, full LED headlamps and also among the first to bring about dynamic turn signals. This time around, they introduce the world's first fully electronic glare free headlamp in the optional Matrix LED headlamp. Of course there are the usual visual tweaks such as the revised bumpers and new trapezoidal exhaust that's available across all variants. The new tail lamps are sleeker than before and, like the front, feature those trick dynamic turn indicators that stream outwards instead of just blinking. The front end gets a slightly revised bonnet, but it's the sci-fi looking Matrix LEDs that will capture your attention most in a car that has seen little overall visual change. These headlamps allow the advantage of having the high beam on all the time without inherent rudeness of blinding on-coming traffic. The high beam is split into 25 different LED segments, which can individually be switched on or off. The system works by using a camera that detects oncoming lights and the lamps then proceed to switch off the LED segment/segments that are throwing light in the direction of the oncoming vehicle. The system works in the blink of an eye and can detect up to eight on coming vehicles. The beauty with this system is that it's completely electronically controlled. Unlike mechanical systems, the Matrix lamps only cut the high beam around the on-coming vehicle, leaving all other parts of the road brightly lit. The cornering light function doesn't use motors either, increasing the intensity of the LEDs at the edge of the lamps instead. 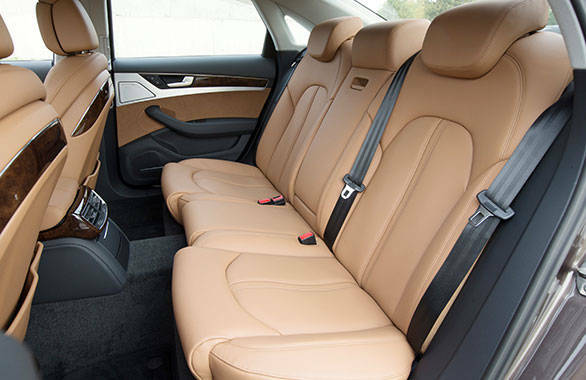 On the inside, Audi offers new 'Unicum' leather that's natural looking as it hasn't been sealed but only treated with a water repellant coating. The clean, wrap around layout we loved in the A8 continues, but there's now an even larger range of customisation on offer with new colour options, inlays and leather grades. Pay more and you could trim your interior in practically any colour scheme using the 'Audi Exclusive' programme. The excellent optional aircraft-style rear seat and entertainment packages continue, and you still have the choice of five massage functions in five intensities. 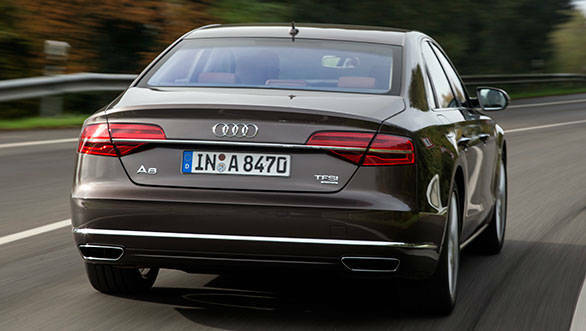 You can spec the A8 with a refrigerator at the rear, power closing boot and power-assisted doors. What's new is the head-up display that gives you speed and navigation information and is a feature worth paying for. The night vision assist now detects large animals as well as humans. It can detect hazards from a distance of 130m and uses the Matrix LEDs to produce three quick bursts of light to alert both you and the obstacle ahead. 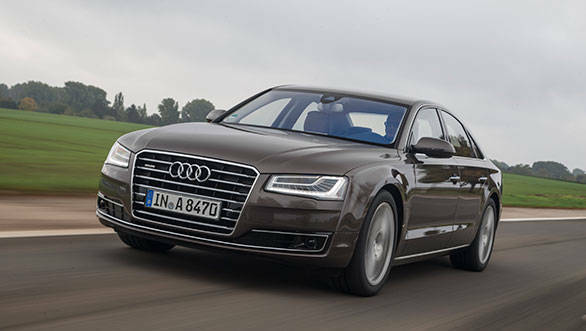 The new A8 isn't just a visual realignment and Audi have also fettled the powertrain for more power and efficiency. Internationally, Audi offers three petrols, two diesels and a hybrid, but we'll focus on the India spec engines. The mighty W12 produces the same 500PS but is now slightly more efficient while the 3.0TFSI gets a 20PS increase and consumes slightly less fuel. The 4.2TDI gets the biggest bump up with 35PS and 50Nm more, and that makes for a total of 385PS and a monstrous 850Nm. Stomping on the throttle is what I imagine getting smacked by the hammer of Thor must feel like. Throttle response is sharp and you get this monumental surge that pins you into the seat, all with a nicely aggressive growl from the V8 diesel. 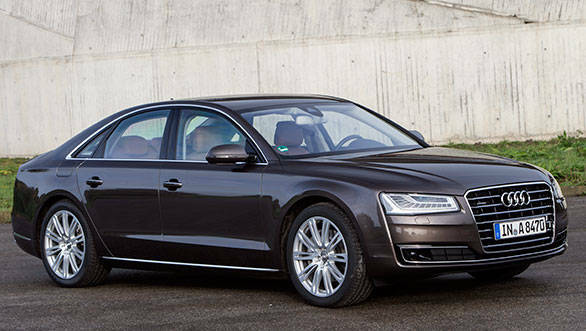 Despite the power increase, Audi claims an impressive 13.3kmpl for the long wheelbase version. However, after experiencing all the engines it was clear that the 3.0TDI diesel makes most sense in the A8. It' silent, smoother than the 4.2 TDI and offers ample performance with a quoted 6.1 second dash to 100kmph, while 200kmph is crossed with ease. Fuel efficiency is up by over 1kmpl for a claimed 16.7kmpl with an indicated range of over 1,000km. No wonder it's the highest selling variant in Europe and India. 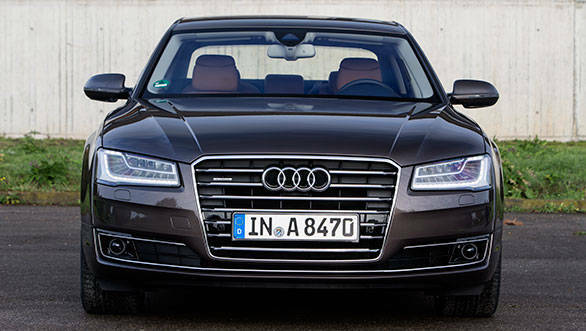 Audi likes to call the A8 the sportiest in its segment, but the truth is that this a back seat car at heart. 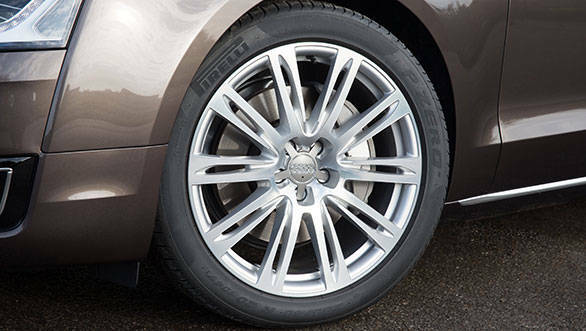 All variants come with an 8-speed auto and Quattro all-wheel drive. The car feels extremely secure in all situations - you can floor the throttle in the 520PS S8 (that won't be coming to India) coming out of a roundabout, and the car simply rockets out without a hint of drama. Cruise at speeds nearing 200kmph on damp, de-restricted autobahn roads and the car still feels rock solid. High speed cruising is what the A8 excels at  sure she'll blast her way up a set of bends but there's not much involvement thanks to the direct, but dull electronically assisted steering wheel and massive dimensions.